This week’s faculty spotlight is on Dr. Peter Luh, who is the SNET Endowed Professor in the Electrical and Computer Engineering Department. He is affiliated with UTC IASE and Booth Engineering Center for Technology (BECAT). Dr. Luh received a Bachelors of Science in Electrical Engineering from the National Taiwan University in 1973. He then went on to receive a Master degree in Aeronautics and Astronautics from the Massachusetts Institute of Technology and a Ph.D in Applied Mathematics from Harvard University. Dr. Luh is a Board of Trustees Distinguished Professor, the SNET Professor of Communications and Information Technologies at the University of Connecticut, Storrs, and a Life Fellow of the Institute of Electrical and Electronics Engineers (IEEE). Dr Luh is the Director of the Manufacturing Systems Laboratory in the Department of Electrical and Computer Engineering, which focuses on advancing information technologies and mathematical optimization techniques that are of strategic importance to society, including Intelligent Manufacturing Systems, Smart and Safe Buildings, Smart Grid, and decision-making under uncertain, distributed, or antagonistic environments. The research conducted in his lab has been supported by the NSF and other industry partners, such as UTC, Southern California Edison, ISO-New England, MISO, Alstom, Northeast Utilities, GE, and Toshiba, over the past 30+ years. His research has led to over 150 journal papers published, over 320 conference presentations, and 35 Ph.D students graduated. Research-wise, he has made pioneering contributions to 1). Intelligent manufacturing for efficient production and on-time product delivery; 2). Smart grid for efficient generator coordination and renewable energy integration; and 3). Smart building for energy efficiency and safety. The overall goals of his research focus on efficiency, greenness and sustainability. Behind these three areas of focus/goals is a revolutionary approach to overcome the notorious combinatorial complexity of mixed-integer optimization problems (involving both discrete and continuous decision variables). The keys include an innovative way to formulate problems in a “separable” and “tightened” form, and an advanced price-based decomposition and coordination methodology. They represent two major breakthroughs and new directions in formulating and solving such important but difficult optimization problems. These exciting results were developed together with his graduate students and colleagues, in particular, Assistant Research Professors Mikhail Bragin and Bing Yan, and Associate Professor Peng Zhang. Dr. Luh received the IEEE Robotics and Automation Society (RAS) Pioneering Award in 2013 for his contributions to the development of near-optimal and efficient planning, scheduling, and coordination methodologies for manufacturing and power systems. Beyond journal papers and conference presentations, Dr. Luh has delivered 140 invited talks around the world. His current research is supported by grants and contracts from the NSF, United Technologies Corporation, ISO-New England, MISO, ABB, Brookhaven National Laboratory, and UConn Provost Academic Plan. In terms of his teaching career, Dr. Luh is a distinguished and accomplished professor who regularly teaches systems-related courses. Among his 35 Ph.D. students graduated, three received the School of Engineering’s Distinguished Engineering Alumni Award, one is a member of Chinese Academy of Sciences, and one served as a National Communication Commissioner in Taiwan. Professor Luh also has participated many times in the School of Engineering’s week-long daVinci Projects, which are designed for high school mathematics, science teachers, and counselors. During his time here at UConn, he has served as the director of BECAT (1997-2004), and the Head of the Electrical and Computer Engineering Department (2006-2009). He has served on various committees within the university, such as the Faculty Review Board (1997-1999), the Research Advisory Council (1998-1999), the University Academic Vision Committee (2013-2014), and the Center and Institute Review Committee (2017-2019). Professor Luh has also played a vital role in IEEE. He served as the Editor-in-Chief of IEEE Transactions on Robotics and Automation (1999-2003), the founding EiC of IEEE Transaction on Automation Science and Engineering (2003-2007), RAS Vice President for Publications (2008-2011), and received the IEEE RAS George Saridis Leadership Awards for his exceptional vision and leadership in strengthening and advancing automation. He is currently the Chair of IEEE Technical Activities Board Periodicals Committee for the 2018-2019 term, and oversees 190 IEEE journals and magazines. UTC-IASE Professor Xu Chen and student Dan Wang received the Best Paper Award at the 2018 International Symposium on Flexible Automation (ISFA). The ISFA was initiated in 1986 under the co-sponsorship of the American Society of Mechanical Engineering (ASME) and the Institute of Systems, Control, and Information Engineers (ISCIE) in Japan. The symposium focuses on automation technologies that are essential to meet the increasing requirements of modern manufacturing and other related fields, such as dynamical systems, robotics, logistics, medical systems, and healthcare systems. The 2018 symposium was held in Kanazawa japan from July 15th, to July 19th. Each year, the symposium recognizes the two best papers appearing in the proceedings and presented at the symposium. One award emphasizes the paper’s contribution to theory, and the other award emphasized significant or innovative applications/practices. Criteria for selection include the quality of the written and oral presentation, the technical contribution, timeliness, and practicality. Each awardee is given a certificate and an honorarium of $1,000. The paper, titled “Synthesis and Analysis of Multirate Repetitive Control for Fractional-order Periodic Disturbance Rejection in Powder Bed Fusion”, discusses control approaches to advance the quality of repetitive energy deposition in powder bed fusion (PBF) additive manufacturing. More specifically, it pertains to the repetitive deposition of the laser or electron beam energy. The paper addresses an intrinsic limitation in control schemes that can be used to leverage the periodicity of task patterns to significantly improve system performance. Some of the long-term impacts anticipated for this work include greater quality assurance of the manufactured parts, new capabilities for large-scale 3D printing of extreme materials, and smarter machines and automation in additive manufacturing processes. The Clean Energy Smart Manufacturing Innovation Institute (CESMII) recently announced its’ selections for its first public-private partnership projects to advance Smart Manufacturing technologies in the United States. Out of the 41 proposals submitted from 62 different organizations, The UConn project titled “Energy Management Systems for Subtractive and Additive Precision Manufacturing” spearheaded by UTC-IASE’s director Dr. George Bollas, was selected as one of only 10 projects from across the country. The ten nationally-selected projects, ranging from 12 to 24 months in duration, will be receiving approximately $10 million in funding, with an additional $6 million in cost share to advance Smart Manufacturing technologies. The UConn project aims to develop and demonstrate benefits of using Smart Manufacturing (SM) approaches that are applicable to subtractive and additive precision manufacturing. The main objective of the project is to mitigate energy waste in manufacturing facilities, specifically additive and subtractive manufacturing, using model-based systems engineering principles. One of these principles is a process called Coordinated Utilization, which encompasses the fields of systems engineering, advanced controls, data analytics and secure communication protocols. 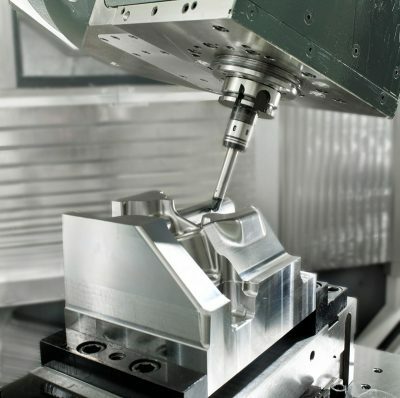 This specific procedure enables efficiency improvements in the precision machining and hybrid manufacturing of metals/alloys to support cross-industry platforms, such as aerospace and orthopedics. This approach will be used to solve the problem of manufacturing waste in manufacturing facilities through five phases. To start, the requirements will be modeled and analyzed in terms of their energy saving capabilities. Sensor network architectures that identify the potential for energy savings will be implemented and optimized. Then, supervisory control structures will be designed for the realization of energy savings. 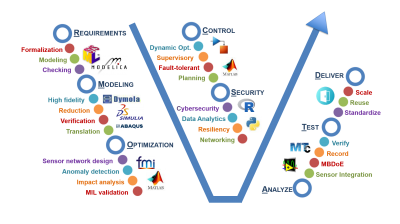 Manufacturing big data will be reduced and securely communicated, and finally, validation of the resulting energy management systems in the manufacturing setting will be accomplished through a model in-the-loop environment. Modules will also be used to help integrate the proposed approach into the Smart Manufacturing platform. Some of these modules include a platform-based system, a multi-level, heterogeneous and hybrid model of the manufacturing and ancillary equipment, predictive analytics, context-driven supervisory control architecture, scheduling of manufacturing operation, and big data analytics. Using these modules will help to facilitate a variety of advantages and objectives, such as enabling formalization and re usability, anomaly detection, enabling model and control interoperability, securing IoT communication protocols, and to maximize energy savings. Focusing on the overarching goal to establish high impact and cost savings through advanced manufacturing technologies, UConn will partner with the Connecticut Center for Advanced Technologies (CCAT), United Technologies Research Center (UTRC), Pratt and Whitney, DePuySynthes, and Johnson & Johnson to implement their design, and to study its efficiency and effectiveness in the field. The first trial run will be conducted at manufacturing facilities of CCAT, which will be used as test beds for the implementation and validation of the research tasks and the methods developed in this experiment. After the initial testing is done at CCAT, the maturation and application of the methodologies and technologies developed in this project will be implemented in four stages. The first stage is the deployment of methods developed in manufacturing facilities in UTRC and Pratt and Whitney for energy and yield efficient production of components for the aerospace industry. The second phase is the deployment of the methods developed in the manufacturing facilities of DePuySynthes and the Orthopedics division of Johnson & Johnson, for the energy and yield efficient production of components for the orthopedics industry. The third stage will be to fill in the gaps and enhance the value of the SM platform by demonstrating the core capabilities developed on the SM platform, using tools available in the SM platform and by building new capabilities to be shared through the platform. The final stage is the development of training programs targeted to challenges in smart manufacturing deployment and talent gaps. After the project completion in May of 2020, the team anticipates having achieved all the goals set forth for this project, and to help facilitate significant industrial impacts. The first of these goals is to lead a national effort to develop, research, test and widely validate SM technologies and practices in a continuously evolving manner. To test and validate SM technologies, the project will also need to develop a protocol for how these technologies should be employed and used effectively. To help with this, another goal for this project is to develop a road map for SM technologies, practices, services, and training and update the road map periodically as needed, to keep up with the changes and demand of the industry. The team will also work to support SM Research and development to provide capabilities for and collaboration in open, pre-competitive among multiple partners, parties, and companies. This work will help establish a technical education and workforce development program that leverages regional networks and will also stimulate growth of a SM domestic supply chain. Finally, at the end of the project, the team hopes to see that the research and work conducted will demonstrate participation of underrepresented groups in CESMII and that the work will be financially self-sustaining after the five-year period of federal funding. These goals and objectives set forth for this specific project are driven by the overall performance metrics for CESMII. Through all CESMII projects, the organization hopes to see energy productivity gains in US manufacturing doubled in 10 years, a 15% improvement in energy efficiency in industrial test beds within 5 years, costs of SM technologies reduced by 50% in 5 years, installed and operating costs of SM recovered through energy savings in 10 years, the SM workforce capacity in the US increased two-fold by 2020, and five-fold by 2030, and finally, the SM supply chain increasing value and participation 40% by 2030. CESMII and all its partners aim to become financially self-sustaining after the end of the five-year federal funding period. This sustainability will be accomplished through the comprehensive membership model that CESMII is applying to industry members, as well as accomplishing both the project goals and the overall CESMII goals. As well as anticipating significant industrial impacts and an increase in sustainability, the CT project also projects to have significant reductions in manufacturing costs, energy savings, and a great increase in production efficiency. The UTC Institute for Advanced Systems Engineering received a small award from the National Science Foundation for the planning of an Industry University Cooperative Research Center. Led by Dr. George Bollas and with participation of researchers from the UTC-IASE and the Eversource Energy Center, UTC-IASE will organize workshops and info sessions with the goal to attract industry interest for participation in a Center researching Networked Embedded, Smart & Trusted Things. Modern Cyber-Physical Systems (CPS) enable integrated sensing, computing, actuation and communication functions in everyday customer devices (home appliances, buildings, roads, jet engines, automobiles, etc.). Their integration in the “Internet of Things” (IoT) provides an unprecedented opportunity to collectively access and process enormous amounts of data. The vision of the Center for Networked Embedded, Smart and Trusted Things (NESTT) is to contribute to the development of an equitable, safe and secure connected world. NESTT will achieve this vision by focusing on creating holistic IoT solutions, integrating technology disciplines with expertise in law, business, and humanities. The University of Connecticut will work together with the Arizona State University, University of Southern California, University of Arizona, and Southern Illinois University to form a new NSF Industry University Cooperative Research Center (IUCRC) named NESTT. The objective of the UConn’s site planning project is to hold workshops with industry partners and NESTT partner universities. 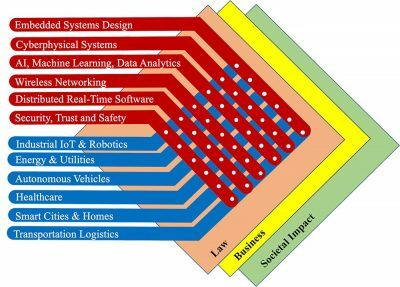 The goal of these workshops is to outline a research agenda and identify industry support for an IUCRC focused on providing IoT solutions specific to cyber-physical systems, IOT requirements and architecture, cybersecurity, industrial IOT for smart manufacturing, smart buildings, grid modernization, and transportation. These application areas will be supported by UConn’s expertise in systems engineering, distributed edge and cloud computing, formal methods, machine learning, data analytics, cyber-physical security, prognostics and diagnostics. The multidisciplinary research at NESTT aims to integrate societal and technological aspects of IoT as a systems engineering and design problem. New scientific discoveries in NESTT and their integration with industrial practice could enable economic growth and provide societal and environmental benefits. Access and opportunities to students who are underrepresented in STEM disciplines and relevant technology areas will be a priority.